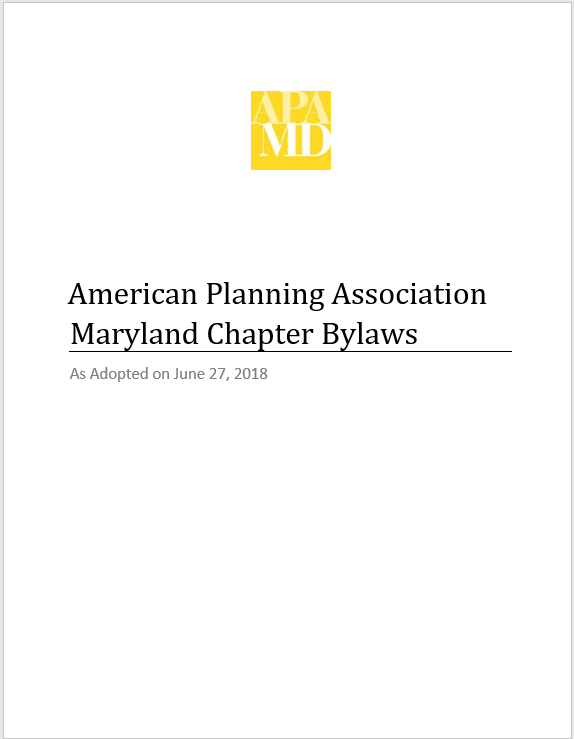 APA Maryland’s chapter bylaws are based on model bylaws created by the American Planning Association. Our bylaws control how we are organized, authorize the various positions on the Executive Committee, assign responsibilities to Committee members, and set out our elections and budgeting process. Our bylaws have been amended multiple times over the years to keep them up-to-date and to ensure that APA Maryland continues to function to serve the interests of its members. APA Maryland’s current bylaws were last amended at the Chapter’s annual meeting on June 27, 2018 in Annapolis, Maryland. Most amendments were minor and were related to creating more efficient Chapter operations. Below are links to previous versions of APA Maryland’s bylaws from 1994 through 2017. Note that the Chapter does not possess copies of previous bylaws from 1978 through 1994, nor do we possess copies of bylaws from our predecessor organization, the Baltimore Chapter of the American Institute of Planners (AIP).